Connect To Your Inner Self With Inspiring Mandala! Could you resist to spending artistic moments with a deluxe Mandala Coloring book, to express your inner emotions, ward-off stress and tune-in to your real self, in perfect harmony with the universe? Get In Tune With The World With A Premium Mandala Adult Coloring Book! Let this deluxe Mandala coloring book for adults take you on a peaceful trip to the harmony of a larger universe, get away from all hustle and bustle of daily life and focus on your real self! Indulge in a peerless coloring experience, taking advantage of the countless opportunities for creative combination of colors provided by old-aged Mandala art! Let the 74 inspiring pictures relax you, fill you with positive energy, wash away stress, fatigue or physical pain and offer you a a rejuvenating drawing activity , a uniquely rewarding way to put your artistic skill on paper! 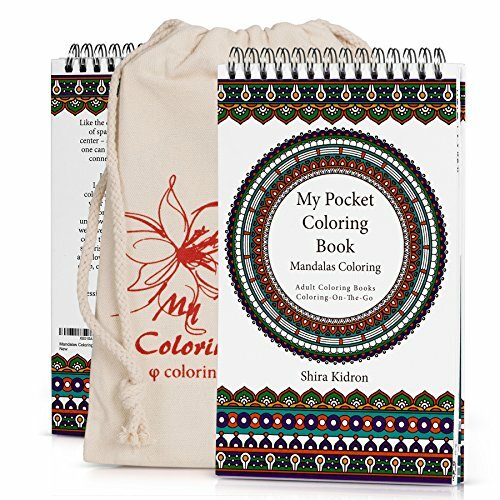 The compact 8.3"x5.11"size allows you to carry your Mandala coloring book anywhere; in a purse, briefcase, or tote! Let the stress-relieving Mandala art connect you with your inner self and offer you a one-of-a-kind experience of coloring-on-the-go! Offer Mandala Coloring Book to your friends, family or co-workers, to seasoned or beginner artists! Help them relax creatively on all occasions and enjoy their ear-to-ear smile! - BONUS: 1 Weekly printable adult coloring page for ONE WHOLE YEAR! Purchase Your Very Own Coloring-On-The-Go Mandala Coloring Book & Tune-In With The Universe! ❤️ LET STEAM OFF WITH INSPIRING MANDALAS: Treat yourself to a uniquely relaxing experience coloring with 74 high-resolution, breath-taking Mandalas that will help you relax and express your creativity in the most original way! Express your artistic skills, relievestress, delve into the mysteries of the universe gain precious inner peace with this deluxe Mandala Adult Coloring Book! ❤️ HIGH STANDARD THICK PAPER BOOK: The quality THICK and HEAVY paper of this Coloring-On-The-Go adult coloring book makes it the perfect expression means to cultivate your artistic skills! Combine safely gel pen, markers, color pencils or watercolour pencils and enjoy the ultimate bleeding-free coloring experience wherever you are! ❤️ A TRAVEL-FRIENDLY ADULT COLORING SET: The special design of this Mandala adult coloring in the portable 8.3"x5.11"/21x13cm size, will accompany you in all your car, train, boat or plane travels and all your daily outdoor activities. Just pack your coloring book in the deluxe CANVAS POUCH, and carry it conveniently in your purse, backpack or handbag to never prevent inspiration from being freely expressed! ❤️ WITH THE GUARANTEE OF GOLDEN RATIO: Let this Book Golden Rectangle proportion cover take you on an invigorating journey to the Divine Proportion through coloring! Indulge in the world-famous Golden Ratio where so many artworks from DaVinci's Mona Lisa to the Pyramids at Giza, and even the Apple logo, are said to be designed! ❤️ FOR LIMITED TIME ONLY! -Purchase 2 or more Coloring Book offered by Klementine's World and get 1 of them free. Just enter code USECOLOR at checkout. AN EXCELLENT GIFT: FREE WEEKLY PRINTABLE ADULT COLORING PAGE for One Whole Year as an exclusive BONUS to help you express your artistic skills with a stunning new picture every week! A unique value overall pack, our Mandala book will make an IDEAL GIFT on your friends birthday, on Christmas or on any occasion, showing off your exquisite taste! If you have any questions about this product by Coloring-On-The-Go, contact us by completing and submitting the form below. If you are looking for a specif part number, please include it with your message.